I am also trying to put together a classes and clubs schedule for the next 6 months. I am opening a new club in February, so let me know if you would like to join us, or you know someone else who would like to do so. Here are some new classes for you. 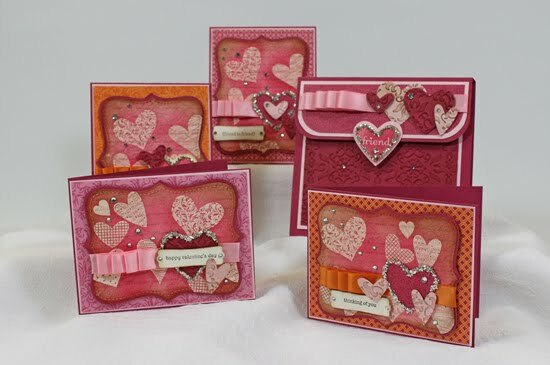 This Valentine's Day, why not gift a loved one this beautiful Vintage Valentine gift set. 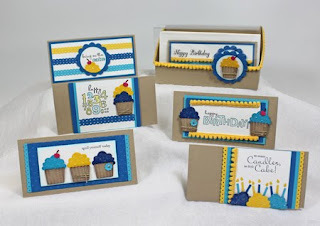 The vibrant colors and patterns from the Sweet and Sour Speciality Designer Paper add an amazing background for each of the four cards, and who doesn't love the added "bling" that the Basic Rhinestones and Silver Glass Glitter adds to each of the cards and the matching portfolio! Location: My house, 3150 Stephens Street. To reserve your seat please call or email me. Sign up and pay by January 5th and save $5 off your class fee. The button below will only be active until January 5th. This fun, bright and colourful birthday set gives you so many options! You can choose to make either the boy or the girl version, OR mix it up and make six of each! 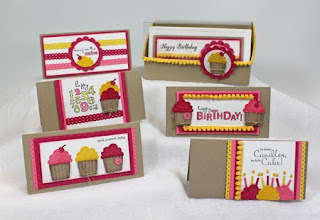 The co-ordinating Birthday Box will hold up to twelve cards and envelopes….so go ahead and have fun! To reserve your seat please call or email me. Sign up and pay by February 5th and save $5 off your class fee. The button below will only be active until February 5th. That is it for tonight. I'll be back in New Year. Meanwhile, have a happiest of New Years and let's hope that 2011 is the best year ever for all of us. I will be teaching this on Saturday, January 22nd, 2-5 PM and Tuesday, January 25th, 6-9 PM. 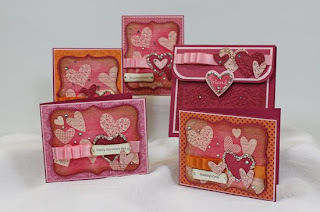 Come and make these adorable cards and a gift box to keep them in. Even envelopes are included. Plus, as always, I will make you a rally good coffee. E-mail me to book your seat. I know I've been absent for a long time again. And, you know, I don't feel bad this time. As usual, life has happened again, but this time it was different. As many of you know, I arrived in Canada almost exactly 16 years ago. I came here by myself, no friends, no family, and I knew there would be good times as well as bad times ahead of me. In a year or so following my arrival, my sister arrived here, as well as the second cousin of mine with his wife and two very young daughters. We usually don't think of second cousins as someone very near and dear to your heart, but these cousins were different. Over the last 15 years they have become very important to me and very much loved. Their children grew into lovely young ladies with great future ahead of them. 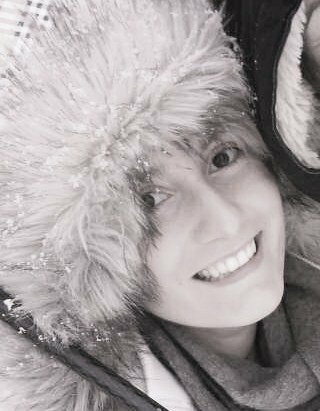 Until three years ago, when at age of 20, their older daughter Natasa was diagnosed with Ewing cancer. For three years she has been fighting this cruel illness with a courage of a lioness. When no one believed that she could get cured, she was certain she would get better. There was so much fate, bravery, wisdom and love in her young life. She was thought of as a miracle child after she managed to walk on her own again although no one believed it possible. And then, the cancer has returned. With a vengeance, attacking her body savagely and without mercy. And boy, did she fight!!! She fought back with every ounce of her mind and fate. Alas, this time she couldn't win. So, if you wonder where I was for so long, how come I don't post - the life has happened again. Only, this time, the life was not something I wanted to talk about. These were the bad times. Look-up baby, it's all blue sky. Put your hands in the air, and soar up high. Get to know the angels, don't be shy. Go on baby, go on - fly.